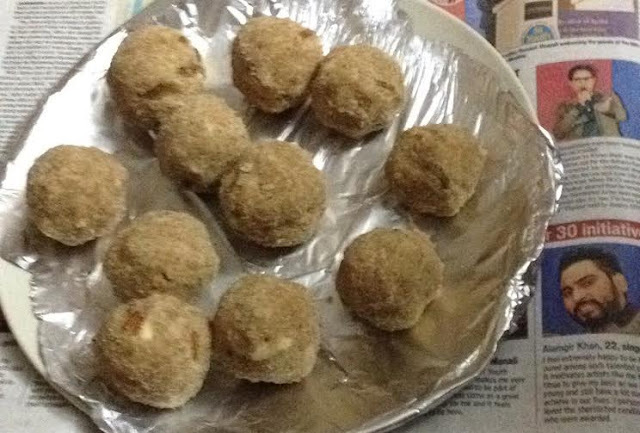 Atta pinni or ladoo are a specialty of Punjab. I remember our parents and grandparents preparing these delicious delicacies during winters when we were young. We would relish this healthy sweet like anything. We love atta pinnis even today, but have made little alterations to the recipe to make it with less amount of ghee, which is a healthier option but isn't great for your heart. This click of atta pinni was taken by my sis-in-law and this is her recipe. Take milk in a pan and add rice flour/cornflour. Add crumbled paneer and switch on the flame. If you are using khoya, you may not need milk. Simply add khoya to the pan and heat on low flame. Roast wheat flour on low flame until nice aroma fills your kitchen. Now add paneer mixture into the roasted atta. Roll out into small balls and flatten them with your palm. If it feels dry, you may add little milk or warm ghee to make balls. Healthy atta pinnis are ready.